Extracellular vesicles (EVs) are secreted by nearly almost cell types and released to the extracellular space. Traditionally, EVs are subgrouped into three classes according to their size: exosomes (30–100 nm in diameter), microvesicles (MVs, 100–1000 nm in diameter), and apoptotic bodies (1000–5000 nm in diameter). Exosomes are small membrane nanovesicles which constituted through the intraluminal budding of the late endosomal membrane and are secreted from the plasma membrane. MVs are efflux directly from the plasma membrane through ectocytosis and apoptotic bodies are occurred through plasma membrane“blebbing” during programmed cell death [3–6]. In both physiological and pathological conditions, EVs are released from cell membranes throughout the body including a wide range of DNAs, mRNAs, multiple proteins, microRNAs (miRNA), long non-coding RNAs (LncRNAs), circular RNAs, and metabolites (Fig. 1). 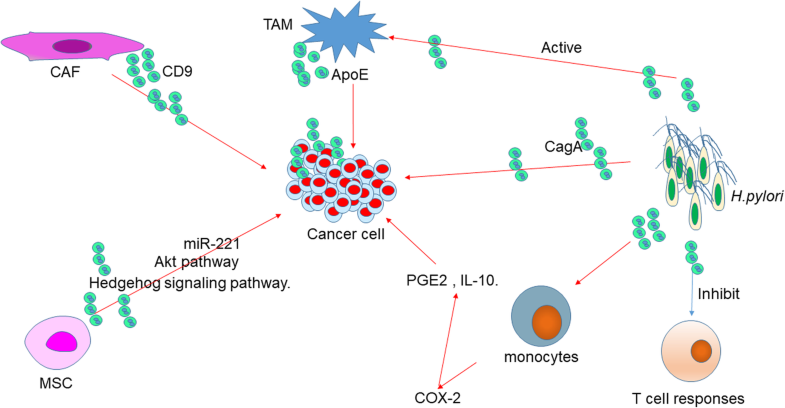 These bioactive substances make interactions among tumor cells, surrounding tumor microenvironment, and distant organs and tissues. The tumor microenvironment contains complex components, such as stromal cells, endothelial cells, immune cells. Therefore, EVs, especially exosomes, are well known with their intercellular communications during tumor progression. Moreover, accumulating evidence suggests that EVs can function as intercellular transport systems according to their contents. The analysis of the contents can help us unveil the function of EVs in cancer, which might be used to identify new biomarkers in cancer diagnosis and therapy. Although there is much unknown and many inconsistent findings in the functions of EVs in cancer development, EVs have enormous potential to be used in clinical practice in the immediate future as the field rapidly expands. 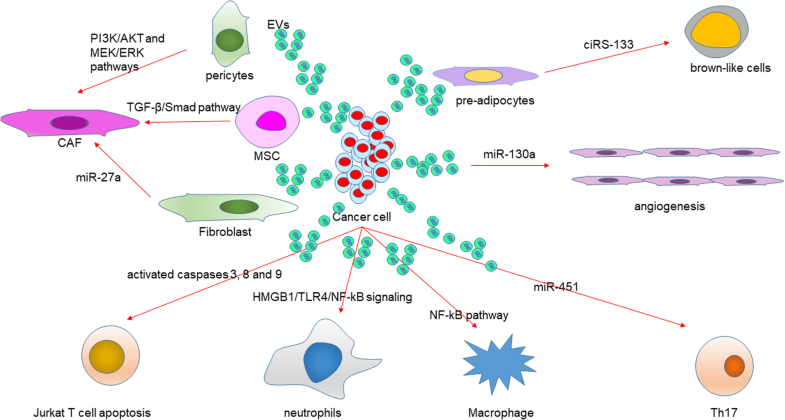 In this review we will describe the key findings on how tumor-derived EVs regulated cancer cell development, metastasis, immune response, drug resistance or communicated with microenvironment in GC. Moreover, we will summarize the multifaceted roles of tumor microenvironment-derived EVs in GC. The potential utility of exosomes as noninvasive biomarkers and in therapy for GC will also be discussed.